But I love these watermelon nails! This design is adorable and easy to do! It looks like it would be difficult but in a few easy steps you have a Watermelon French tip on your nails. I used a nailart brush but you can use a toothpick to get the same effect. I purchased my Nail art brush at my local art supply store for a couple of dollars. - Apply Red Nail Polish to the nails. - Apply White nail polish to the tips of the nails – like an exaggerated French tip. I found using white polish helped the green show up more against the red background. - Apply the Dark Green nail polish to the tip of the nail, leaving some white showing. - Using a toothpick or nail art brush, apply vertical stripes down the tip of the nail (only the green part). I made 3 to 4 stripes on my nails. 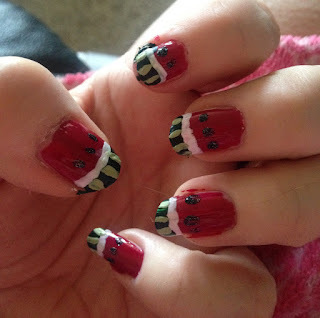 - Using a toothpick or nail art brush, apply short black lines for the seeds. 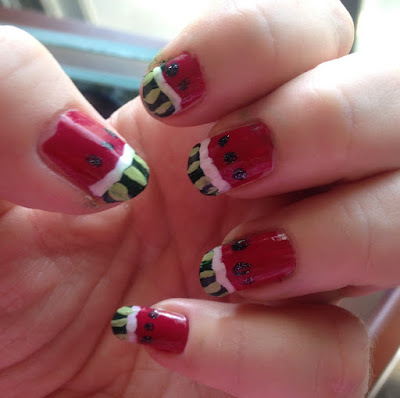 I don't like seeds so I applied 3 lines per nail. - Apply a fast drying top coat to give your mani a beautiful shine.